SEOUL, South Korea (AP) — South Korean special prosecutors indicted Samsung’s de facto chief Tuesday on bribery, embezzlement and other charges linked to a political scandal that has toppled President Park Geun-hye. 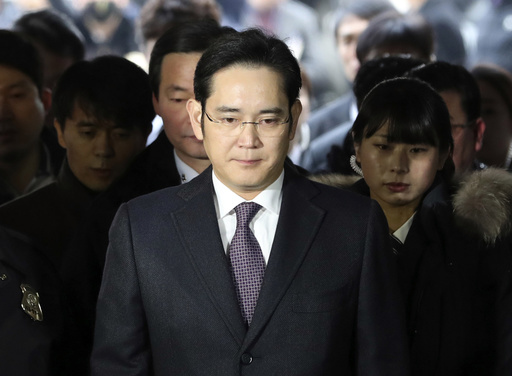 The indictment of Samsung Electronics vice chairman Lee Jae-yong is a huge hit for the largest and most successful of the big businesses that dominate the South Korean economy. It also signals the still roiling state of South Korea’s political and economic circles after weeks of massive demonstrations that led to Park’s impeachment. The announcement of the indictment came after a three-month investigation by a special prosecution team that ended Tuesday after the country’s acting leader refused a request for an extension. Shortly after the announcement, Samsung said several top executives also facing criminal charges will resign from their positions and leave Samsung. It did not say anything about Lee’s status, implying that the Samsung heir will likely keep his position and board membership at Samsung Electronics while he is under arrest and stands trial. Prosecutors say Lee gave bribes worth $36 million to Park and her confidante to help win government support for a smooth leadership transfer from Lee’s ailing father to Lee. Lee also allegedly hid assets overseas, concealed proceeds from criminal activities and committed perjury. The 48-year-old billionaire was arrested Feb. 17. Samsung has denied wrongdoing. Prosecutors also said they planned to indict four other Samsung executives on charges of offering bribes, embezzlement, hiding assets overseas and concealing proceeds from criminal activities. The indictments mean that key figures at a powerful yet secretive Samsung office that wielded influence over dozens of Samsung affiliates face trial. Lee promised in December to disband the secretive office, called the Corporate Strategy Office, which allegedly orchestrated bribery schemes centered on Choi Soon-sil, Park’s confidante. The office consists of close Lee family aides who worked to help ensure the father to son leadership transition. Some say the contentious merger of Samsung C&T and Cheil Industries in 2015 was also overseen by the office, not by the board of directors at the two Samsung companies. The merger, a crucial step for Lee to strengthen his grip on Samsung Electronics, was a key benefit that Samsung sought from the government by offering millions of dollars to Choi’s various entities, according to the prosecutors. The merger, despite opposition from some shareholders who argued that it unfairly benefited the Lee family, was approved by shareholders thanks to the support of a state-controlled national pension fund, a key Samsung investor. The special prosecution team said it also plans to pursue additional charges of bribery and concealing proceedings from criminal activities against Choi, who allegedly exploited her presidential ties to extort money and favors from companies and manipulate state affairs from the shadows. The team finished its inquiry without questioning Park, after she backed off from a Feb. 9 interview. The country’s acting leader, Hwang Kyo-ahn, refused to extend the investigation past Tuesday’s deadline. Lee was once the face of the new Samsung, but now follows in the footsteps of his father, Samsung Electronics chairman Lee Kun-hee. The senior Lee was indicted in 2008 on charges of tax evasion and breach of trust. He was later convicted and then pardoned by a former president. Corruption has dogged many other business leaders in South Korea’s family-controlled conglomerates, which are known as chaebol. When the elder Lee was indicted, Samsung vowed a series of measures to improve transparency. After the prosecutors’ announcement Tuesday, Samsung said it would disband the secretive office. Since Lee’s father fell ill in May 2014, the younger Lee has stepped up his leadership role. Samsung appeared to be trying to change its top-down, hierarchical, authoritarian corporate culture under Lee. Fluent in foreign languages, educated overseas and linked to Silicon Valley luminaries, Lee was seen as the new face of Samsung. Samsung promised to remove obstacles to creativity and innovation in recent years by introducing a nimble, startup-like attitude. It has increased returns to shareholders and acquired several companies outside South Korea.